The 21-year-old Hilinski was discovered in his apartment after he didn't show up for practice Tuesday. 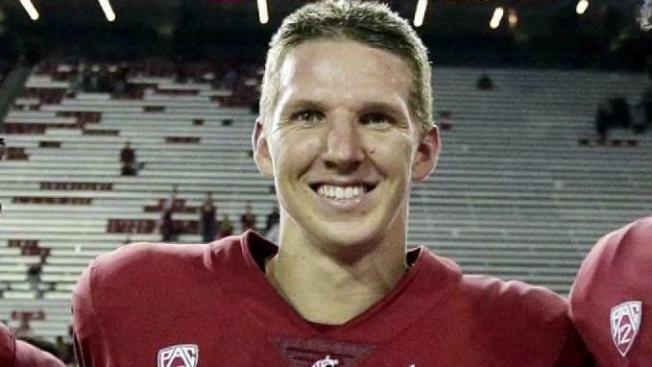 A rifle "was recovered next to Hilinski and a suicide note was found," according to the Pullman Police Department. Hilinski was the presumptive starting quarterback going into next season. He started Washington State's Holiday Bowl loss to Michigan State after Luke Falk was unable to play due to a wrist injury. Hilinski appeared in eight games during his sophomore season, throwing for 1,176 yards and seven touchdowns. His most memorable outing came in the second week of the season when he led Washington State from a 21-point deficit in the fourth quarter to beat Boise State 47-44 in triple overtime. Hilinski threw for 240 yards and three touchdowns coming off the bench. Former Washington State linebackers coach Roy Manning, who recently left for a position at UCLA, tweeted , "Words can't describe what I'm feeling right now. My heart is beyond saddened. Please pray for the family and all of us affected!" Hilinski is from Claremont, California, and went to high school at nearby Upland. He arrived on campus in 2015 and redshirted before appearing in four games in 2016.